Among the issues Shelly Sterling is considering, the source said, are the substantial tax obligations she would incur from the sale. According to IRS rules, the Sterlings would have to pay a federal long-term capital-gains tax of 20 percent and a California tax of 13.3 percent. The tax would be on the difference between what the team was bought for and what it is ultimately sold for. 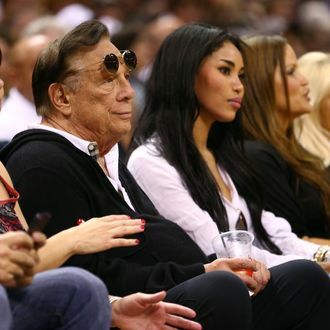 If the team is sold for $1 billion, the Sterlings would be taxed $328.5 million on the sale. But substantial progress has apparently been made since Donald’s latest batch of still-racist secret recordings, in which he said he’d fight the forced sale, and Shelly’s insistence that she wouldn’t give up that easily either. Along with ending this ordeal for everyone, let’s not forget, the Sterlings still stand to make piles of money. Also - the NBA spent the past few days painstakingly explaining to Sterling just how much money he'd lose by suing to keep the Clips.